FÄLTSTUDIER (– in English, Field Studies-) is a site-specific art project that investigates the connection between place, space and belonging. It invites the public to participate in a multi-disciplinary examination of a specific biosphere. During two weeks of July 2016 the project hosted an eclectic programme of lectures, discussions and workshops in the seaside village of Beddingestrand, southcoast of Sweden. Grassland, wind gusts and floral scent. The sound of the wind in the pine trees and distant birdsong. Soft soil and grass under rounded clouds that occasionally let the heat of the sun slip through. A wall over a carpet of grass and flowers: lady’s bedstraw, sorrel, bluebells, thrift, thyme and more. And overlaying it all is the constant noise of the sea. The air is clear after the night’s thunderstorm. Beddinge Strand is a village on the south coast of Sweden. It is eight in the morning. A few people slowly make their way to one corner of heathland by the sea. Colourful yoga mats are laid out on the grass and slowly they are occupied by people from the sleepy village. During the next hour the group will follow instruction in yoga while gazing out over the sea in morning light. Slowly their bodies wake up and in the stillness of the yoga they absorb the sounds and smells of the site. A mouth-watering, healthy breakfast is waiting, served from old wooden beach trolleys by volunteers in yellow aprons. Home-made bread and jams, hummus, avocado, paprika, fruit yogurt and granola, coffee and tea is consumed by the side of a yellow fabric windbreak situated in a meadow of grasslands and low pines. Newcomers arrive and slot easily in to the community spirit and everyone is enjoying each other’s company and the fact that breakfast always tastes fantastic when it is served outside in the fresh air. Between 30 and 70 people gather around the yellow windbreak to participate in workshops or lectures under the name FIELD STUDIES. All activities take place in The Field. New knowledge is acquired and new friends made. Comfort zones are stretched. One day we learn to identify all of the plants which grow in The Field. We find over 70 species in 2 hours. The next day the focus is on lines and colours derived from gazing out over the landscape. The next workshop introduces a day when memories from the field are shared and creative writing is pursued. Our special guest is the 92 year old Peggy who shares with us the tale of how she found a dead German sailor washed up on the beach during World War 2. The last day’s focus is on sound: to listen to the range of sounds in nature, and to make our own sounds. On a hot summer’s day the two-week project comes to its high point in a ’Field Celebration Day’. A tree-lined ‘room’ in a secluded area becomes an art centre for the day. All of the art works produced during the workshops are on show, embroidery and photographs from the project are presented. There is a colourful art workshop for children and adults. Finally, two (locally known) poets do readings, while people sit around on blankets in the shade of the pines enjoying their picnics. The following week this outdoor showcase exhibition moved to a small studio gallery in the village. This acted as a memory archive for the project’s participants and other curious members of the public. FIELD STUDIES was a project that operated on many different levels, both as social study as well as a sensory and artistic investigation. It demonstrated that the rich combination of collectively engaging in art & craft making, discovering new knowledge and making new friends all helps to enrich our lives. It gives a feeling of engagement and self-actualisation. This project created strong bonds between community members, motivating them to engage with one another in the future. To engage the hand and mind in mark-making (drawing, embroidery, writing, and recording) creates a much deeper memory connection than that given by a superficial snapshot on social media. The above text is a summary of what took place during the project FIELD STUDIES, which I curated and produced during July 2016. FIELD STUDIES used Beddinge Strand, a seaside village on the South coast of Sweden, as a backdrop for a two-week-long project where different sensory, disciplinary and intellectual lenses were used to create a rich, multi-faceted connection between the location and the local people. During the project, the residents and the general public were invited to participate in a series of events, workshops and lectures, that focused on a small nature reserve situated between the sea and the village houses, an area I will call The Field for ease of reference. The Field was looked at from the point of view of botany, ecology, history, visual investigation, embroidery and soundscape. FIELD STUDIES took its inspiration from human geographer Yi-Fu Tuan’s belief that an active and reflective perspective is essential to understanding space and place, and that it creates a better understanding of one’s identity. Tuan suggests that a study of place achieves concrete reality when our experience of it is total, i.e. through all the senses as well as with the active and reflective mind. This belief formed the core of FIELD STUDIES. The project used Tuan’s theories on different levels. Firstly it looked at how specific places evoke a longing for home in each of us. It looked closely at all the sensory experiences that a place can give, but was also mindful that prior knowledge expands this experience. The six different site investigations were constructed to promote a bonding with the place, and to create connections between individuals, both new and old. FIELD STUDIES was an investigation which brought surprises both for me and for the participants. The Field was explored from many different angles, using deep mapping techniques as well as all five senses. The Field is a wide, open space between the sea and the sky. I felt it was essential to also create a focus for the activities of the investigations. This prompted me to create windbreaks which acted as ‘home’ for each investigation while we absorbed the open space: the field, the sky and sea. The windbreakers enclosed a smaller place from which we could absorb the wider space, a security from which we could taste freedom. We explored the concept of pyschogeography through a deep mapping of the field and an exploration of identity, place, narrative, history and memory. Pierre Bourdieu  describes the meaning of ‘field’ as a structured ‘system of social positions’ occupied either by individuals or institutions, the nature of which defines the situations for their occupants. Field Studies therefore operated on many different levels, both as a social study and a sensory and artistic investigation of a unique agrarian space. In the planning of FIELD STUDIES and throughout the project I wanted to use local expertise as much as possible. Certain specific investigations, such as the embroidery, were woven into the project because these skills ’happened’ to be present in the village. The focus group, consisting of six local people, grounded the scope of the project at an early stage and helped me to clarify and galvanize what was going to take place during the summer. It was very important and necessary to have people from the village engaged both as investigation guides and as volunteers. This created a strong bonding and resulted in motivation for future engagement. There were volunteers who helped with funding applications, advertising and public relations, screen-printing tote bags and preparing the breakfasts. There were also those who helped with putting up the windbreaks, photographers who documented each day to professional standards, a mediator for the ecology lecture day, and all those people who helped to prepare for the final Field Celebration Day. In fact, the entire project depended on a network of people who willingly gave their time freely and generously to make it happen. Those participants who took part in the project over several days seemed to have both a stronger sense of affiliation and a radically changed perspective on The Field. This new sense of belonging incorporated a mixture of experiences, depending on which activities the individual took part in. For some the yoga in the early part of the day, being part of a small group moving together with a view over the sea and the sun slightly warming the body, was a strong grounding. This crystallised the experience of both place and space. For others the outdoor breakfast was the highlight: sharing food, sitting simply on the grass, in silence or in conversation, creating community. The breakfast helped to create a sense of special occasion around The Field activity. Each investigation resulted in a different outcome according to the activity of the day. I observed that the participants were reflective, mindful and willing to operate outside of their normal comfort zones. On one occasion thirty people joined me and sound artist Ewert Ekros inside the windbreak, and we all joined in a spoken choir of random flower names. It was loud, powerful, spontaneous, energising and unusual, yet everyone participated without hesitation. This was remarkable in a small, conservative, semi-rural community. Another observation was that most participants really enjoyed making new connections with people who were previously unknown to them. I encouraged this by constantly dividing the big group into smaller groups for discussions and activities - always mixing people who did not know each other from before. The project was blessed with good weather all through the two weeks, which made it possible to stage each investigation in the open air, in The Field itself. My choice of different specific settings for each of the investigations was a core concept in the development of the project. I wanted the participants to experience The Field from different locations and through that to gain new perspectives of the landscape each day. Normally people do not sit in The Field - they usually walk through it on the way to the beach. Sitting still and looking carefully provides a radically different perspective on a familiar location. Depending on the weather and wind, the activity and the location, I altered the shape of how the windbreak was erected each day. There were many who reacted positively to the varied locations for each day. There was only only constraint. The windbreak always had to be visible from the main entrance of The Field. The six investigations provided a dynamic collective energy that surprised and delighted me. Through practical workshops and guest lectures it delivered a sensory field study experience which created a powerful memory archive for the participants. Memory, participation, interaction and the project artefacts (branded windbreaks, aprons, signage and tote bags) created a new sense of place and of topophilia for each of us. FIELD STUDIES was a project that operated on many different levels, both as social study as well as a sensory and artistic investigation. All encounters with participants during the project were enriching for me, both as an individual and a practitioner in the field of socially engaged arts. That is not to say that it was always easy! In framing this project, it helped enormously that I have a history in the village. Even if not many of the participants knew me personally from before, I was not a ‘blow-in’, and because of that they trusted me. I believe that it is essential in a project like this that you truly understand the society within which you are operating. I speak in the same local dialect as most of the people who live in Beddinge Strand. I know the old local stories about the fishermen who fished there when I was a child. I think that this sense of belonging and understanding is essential for a successful engagement in socially engaged art. Pablo Helguera, suggests that the key to a successful project lies in understanding the social context in which it will take place and how it will be negotiated with participants and audience. I have a special connection to Beddinge Strand and The Field, having spent every summer of my life here. I now feel that I have a profoundly different relationship to the village, and especially to The Field. I am more connected, I can relate to and understand the place better, and I have widened and deepened my knowledge of many different aspects of The Field. I have also learned to know many new and interesting people, some of whom have become new friends. I feel that I have discharged a part of my personal ‘debt’ to this wonderful and precious place and to these people. I have personally been the most privileged participant and greatest beneficiary of the Field Studies project. I will conclude by saying that the project engendered new ways of relating to both the place and the space of The Field. Additional benefits included new connections and friendships in the village and new perspectives, skills, and interests for participants. The collective engagement with art and craft as a platform formed a powerful aide-mémoire in itself, an experience that stays with us in a way that passive observation or consumption does not. ‘Thanks for inviting me to take part. I think it was a brave and exciting programme. Looking at how many people took part I must conclude that there is a general desire for engagement in projects like this’. Liz Nilsson, 2 April, Dublin 2017. Pierre Bourdieu was a French sociologist, anthropologist, philosopher, and renowned public intellectual. a strong sense, love and cultural identity for a specific place. 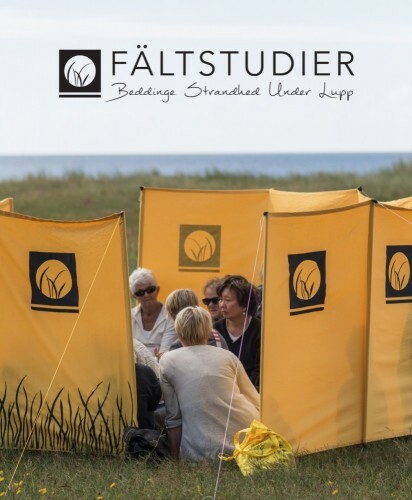 FÄLTSTUDIER used Beddinge Strand on the south coast of Sweden as a backdrop for a project in July 2016, where different sensory and intellectual lenses were used to create a rich connection with the location and between local people. Approached by a sensory macro lens and the methodology of deep mapping, the delicacy and composition of this site was surveyed and documented through the dynamic, synergistic and complementary practices of art, ecology, biology and cultural-geography. The project took its inspiration from Yi-Fu Tuan’s belief that an experiential perspective is essential to understanding space and place, and with that create a better understanding of one’s identity. These themes were the core of the project. The heath was explored from the many different angels and perspectives of deep mapping and through the use of the five senses. Tuan emphases how important it is to use all our senses to understand a place and situation. The aim with FÄLTSTUDIER is to generate an extended awareness of a site's soul and identity and to create in participants a deeper feeling of belonging to the site. The project also aims to strengthen community involvement and relationships amongst the local population.